Richard, son of the Black Prince, a boy eleven years of age, succeeded to the Crown under the title of King Richard the Second. The whole English nation were ready to admire him for the sake of his brave father. As to the lords and ladies about the Court, they declared him to be the most beautiful, the wisest, and the best--even of princes--whom the lords and ladies about the Court, generally declare to be the most beautiful, the wisest, and the best of mankind. To flatter a poor boy in this base manner was not a very likely way to develop whatever good was in him; and it brought him to anything but a good or happy end. The Duke of Lancaster, the young King's uncle--commonly called John of Gaunt, from having been born at Ghent, which the common people so pronounced--was supposed to have some thoughts of the throne himself; but, as he was not popular, and the memory of the Black Prince was, he submitted to his nephew. The war with France being still unsettled, the Government of England wanted money to provide for the expenses that might arise out of it; accordingly a certain tax, called the Poll-tax, which had originated in the last reign, was ordered to be levied on the people. This was a tax on every person in the kingdom, male and female, above the age of fourteen, of three groats (or three four-penny pieces) a year; clergymen were charged more, and only beggars were exempt. I have no need to repeat that the common people of England had long been suffering under great oppression. They were still the mere slaves of the lords of the land on which they lived, and were on most occasions harshly and unjustly treated. But, they had begun by this time to think very seriously of not bearing quite so much; and, probably, were emboldened by that French insurrection I mentioned in the last chapter. The people of Essex rose against the Poll-tax, and being severely handled by the government officers, killed some of them. At this very time one of the tax-collectors, going his rounds from house to house, at Dartford in Kent came to the cottage of one WAT, a tiler by trade, and claimed the tax upon his daughter. Her mother, who was at home, declared that she was under the age of fourteen; upon that, the collector (as other collectors had already done in different parts of England) behaved in a savage way, and brutally insulted Wat Tyler's daughter. The daughter screamed, the mother screamed. Wat the Tiler, who was at work not far off, ran to the spot, and did what any honest father under such provocation might have done--struck the collector dead at a blow. Instantly the people of that town uprose as one man. They made Wat Tyler their leader; they joined with the people of Essex, who were in arms under a priest called JACK STRAW; they took out of prison another priest named JOHN BALL; and gathering in numbers as they went along, advanced, in a great confused army of poor men, to Blackheath. It is said that they wanted to abolish all property, and to declare all men equal. I do not think this very likely; because they stopped the travellers on the roads and made them swear to be true to King Richard and the people. Nor were they at all disposed to injure those who had done them no harm, merely because they were of high station; for, the King's mother, who had to pass through their camp at Blackheath, on her way to her young son, lying for safety in the Tower of London, had merely to kiss a few dirty- faced rough-bearded men who were noisily fond of royalty, and so got away in perfect safety. Next day the whole mass marched on to London Bridge. There was a drawbridge in the middle, which WILLIAM WALWORTH the Mayor caused to be raised to prevent their coming into the city; but they soon terrified the citizens into lowering it again, and spread themselves, with great uproar, over the streets. They broke open the prisons; they burned the papers in Lambeth Palace; they destroyed the DUKE OF LANCASTER'S Palace, the Savoy, in the Strand, said to be the most beautiful and splendid in England; they set fire to the books and documents in the Temple; and made a great riot. Many of these outrages were committed in drunkenness; since those citizens, who had well-filled cellars, were only too glad to throw them open to save the rest of their property; but even the drunken rioters were very careful to steal nothing. They were so angry with one man, who was seen to take a silver cup at the Savoy Palace, and put it in his breast, that they drowned him in the river, cup and all. The young King had been taken out to treat with them before they committed these excesses; but, he and the people about him were so frightened by the riotous shouts, that they got back to the Tower in the best way they could. This made the insurgents bolder; so they went on rioting away, striking off the heads of those who did not, at a moment's notice, declare for King Richard and the people; and killing as many of the unpopular persons whom they supposed to be their enemies as they could by any means lay hold of. In this manner they passed one very violent day, and then proclamation was made that the King would meet them at Mile-end, and grant their requests. The rioters went to Mile-end to the number of sixty thousand, and the King met them there, and to the King the rioters peaceably proposed four conditions. First, that neither they, nor their children, nor any coming after them, should be made slaves any more. Secondly, that the rent of land should be fixed at a certain price in money, instead of being paid in service. Thirdly, that they should have liberty to buy and sell in all markets and public places, like other free men. Fourthly, that they should be pardoned for past offences. Heaven knows, there was nothing very unreasonable in these proposals! The young King deceitfully pretended to think so, and kept thirty clerks up, all night, writing out a charter accordingly. Now, Wat Tyler himself wanted more than this. He wanted the entire abolition of the forest laws. He was not at Mile-end with the rest, but, while that meeting was being held, broke into the Tower of London and slew the archbishop and the treasurer, for whose heads the people had cried out loudly the day before. He and his men even thrust their swords into the bed of the Princess of Wales while the Princess was in it, to make certain that none of their enemies were concealed there. Some declared afterwards that as Wat said this, he laid his hand on the King's bridle. Others declared that he was seen to play with his own dagger. I think, myself, that he just spoke to the King like a rough, angry man as he was, and did nothing more. At any rate he was expecting no attack, and preparing for no resistance, when Walworth the Mayor did the not very valiant deed of drawing a short sword and stabbing him in the throat. He dropped from his horse, and one of the King's people speedily finished him. So fell Wat Tyler. Fawners and flatterers made a mighty triumph of it, and set up a cry which will occasionally find an echo to this day. But Wat was a hard-working man, who had suffered much, and had been foully outraged; and it is probable that he was a man of a much higher nature and a much braver spirit than any of the parasites who exulted then, or have exulted since, over his defeat. Seeing Wat down, his men immediately bent their bows to avenge his fall. If the young King had not had presence of mind at that dangerous moment, both he and the Mayor to boot, might have followed Tyler pretty fast. But the King riding up to the crowd, cried out that Tyler was a traitor, and that he would be their leader. 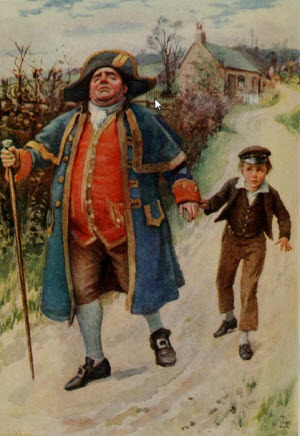 They were so taken by surprise, that they set up a great shouting, and followed the boy until he was met at Islington by a large body of soldiers. The end of this rising was the then usual end. As soon as the King found himself safe, he unsaid all he had said, and undid all he had done; some fifteen hundred of the rioters were tried (mostly in Essex) with great rigour, and executed with great cruelty. Many of them were hanged on gibbets, and left there as a terror to the country people; and, because their miserable friends took some of the bodies down to bury, the King ordered the rest to be chained up--which was the beginning of the barbarous custom of hanging in chains. The King's falsehood in this business makes such a pitiful figure, that I think Wat Tyler appears in history as beyond comparison the truer and more respectable man of the two. Richard was now sixteen years of age, and married Anne of Bohemia, an excellent princess, who was called 'the good Queen Anne.' She deserved a better husband; for the King had been fawned and flattered into a treacherous, wasteful, dissolute, bad young man. There were two Popes at this time (as if one were not enough! ), and their quarrels involved Europe in a great deal of trouble. Scotland was still troublesome too; and at home there was much jealousy and distrust, and plotting and counter-plotting, because the King feared the ambition of his relations, and particularly of his uncle, the Duke of Lancaster, and the duke had his party against the King, and the King had his party against the duke. Nor were these home troubles lessened when the duke went to Castile to urge his claim to the crown of that kingdom; for then the Duke of Gloucester, another of Richard's uncles, opposed him, and influenced the Parliament to demand the dismissal of the King's favourite ministers. The King said in reply, that he would not for such men dismiss the meanest servant in his kitchen. But, it had begun to signify little what a King said when a Parliament was determined; so Richard was at last obliged to give way, and to agree to another Government of the kingdom, under a commission of fourteen nobles, for a year. His uncle of Gloucester was at the head of this commission, and, in fact, appointed everybody composing it. Having done all this, the King declared as soon as he saw an opportunity that he had never meant to do it, and that it was all illegal; and he got the judges secretly to sign a declaration to that effect. The secret oozed out directly, and was carried to the Duke of Gloucester. The Duke of Gloucester, at the head of forty thousand men, met the King on his entering into London to enforce his authority; the King was helpless against him; his favourites and ministers were impeached and were mercilessly executed. Among them were two men whom the people regarded with very different feelings; one, Robert Tresilian, Chief Justice, who was hated for having made what was called 'the bloody circuit' to try the rioters; the other, Sir Simon Burley, an honourable knight, who had been the dear friend of the Black Prince, and the governor and guardian of the King. For this gentleman's life the good Queen even begged of Gloucester on her knees; but Gloucester (with or without reason) feared and hated him, and replied, that if she valued her husband's crown, she had better beg no more. All this was done under what was called by some the wonderful--and by others, with better reason, the merciless--Parliament. But Gloucester's power was not to last for ever. He held it for only a year longer; in which year the famous battle of Otterbourne, sung in the old ballad of Chevy Chase, was fought. When the year was out, the King, turning suddenly to Gloucester, in the midst of a great council said, 'Uncle, how old am I?' 'Your highness,' returned the Duke, 'is in your twenty-second year.' 'Am I so much?' said the King; 'then I will manage my own affairs! I am much obliged to you, my good lords, for your past services, but I need them no more.' He followed this up, by appointing a new Chancellor and a new Treasurer, and announced to the people that he had resumed the Government. He held it for eight years without opposition. Through all that time, he kept his determination to revenge himself some day upon his uncle Gloucester, in his own breast. At last the good Queen died, and then the King, desiring to take a second wife, proposed to his council that he should marry Isabella, of France, the daughter of Charles the Sixth: who, the French courtiers said (as the English courtiers had said of Richard), was a marvel of beauty and wit, and quite a phenomenon--of seven years old. The council were divided about this marriage, but it took place. It secured peace between England and France for a quarter of a century; but it was strongly opposed to the prejudices of the English people. The Duke of Gloucester, who was anxious to take the occasion of making himself popular, declaimed against it loudly, and this at length decided the King to execute the vengeance he had been nursing so long. He went with a gay company to the Duke of Gloucester's house, Pleshey Castle, in Essex, where the Duke, suspecting nothing, came out into the court-yard to receive his royal visitor. While the King conversed in a friendly manner with the Duchess, the Duke was quietly seized, hurried away, shipped for Calais, and lodged in the castle there. His friends, the Earls of Arundel and Warwick, were taken in the same treacherous manner, and confined to their castles. A few days after, at Nottingham, they were impeached of high treason. The Earl of Arundel was condemned and beheaded, and the Earl of Warwick was banished. Then, a writ was sent by a messenger to the Governor of Calais, requiring him to send the Duke of Gloucester over to be tried. In three days he returned an answer that he could not do that, because the Duke of Gloucester had died in prison. The Duke was declared a traitor, his property was confiscated to the King, a real or pretended confession he had made in prison to one of the Justices of the Common Pleas was produced against him, and there was an end of the matter. How the unfortunate duke died, very few cared to know. Whether he really died naturally; whether he killed himself; whether, by the King's order, he was strangled, or smothered between two beds (as a serving-man of the Governor's named Hall, did afterwards declare), cannot be discovered. There is not much doubt that he was killed, somehow or other, by his nephew's orders. Among the most active nobles in these proceedings were the King's cousin, Henry Bolingbroke, whom the King had made Duke of Hereford to smooth down the old family quarrels, and some others: who had in the family-plotting times done just such acts themselves as they now condemned in the duke. They seem to have been a corrupt set of men; but such men were easily found about the court in such days. The people murmured at all this, and were still very sore about the French marriage. The nobles saw how little the King cared for law, and how crafty he was, and began to be somewhat afraid for themselves. The King's life was a life of continued feasting and excess; his retinue, down to the meanest servants, were dressed in the most costly manner, and caroused at his tables, it is related, to the number of ten thousand persons every day. He himself, surrounded by a body of ten thousand archers, and enriched by a duty on wool which the Commons had granted him for life, saw no danger of ever being otherwise than powerful and absolute, and was as fierce and haughty as a King could be. He had two of his old enemies left, in the persons of the Dukes of Hereford and Norfolk. Sparing these no more than the others, he tampered with the Duke of Hereford until he got him to declare before the Council that the Duke of Norfolk had lately held some treasonable talk with him, as he was riding near Brentford; and that he had told him, among other things, that he could not believe the King's oath--which nobody could, I should think. For this treachery he obtained a pardon, and the Duke of Norfolk was summoned to appear and defend himself. As he denied the charge and said his accuser was a liar and a traitor, both noblemen, according to the manner of those times, were held in custody, and the truth was ordered to be decided by wager of battle at Coventry. This wager of battle meant that whosoever won the combat was to be considered in the right; which nonsense meant in effect, that no strong man could ever be wrong. A great holiday was made; a great crowd assembled, with much parade and show; and the two combatants were about to rush at each other with their lances, when the King, sitting in a pavilion to see fair, threw down the truncheon he carried in his hand, and forbade the battle. The Duke of Hereford was to be banished for ten years, and the Duke of Norfolk was to be banished for life. So said the King. The Duke of Hereford went to France, and went no farther. The Duke of Norfolk made a pilgrimage to the Holy Land, and afterwards died at Venice of a broken heart. Faster and fiercer, after this, the King went on in his career. The Duke of Lancaster, who was the father of the Duke of Hereford, died soon after the departure of his son; and, the King, although he had solemnly granted to that son leave to inherit his father's property, if it should come to him during his banishment, immediately seized it all, like a robber. The judges were so afraid of him, that they disgraced themselves by declaring this theft to be just and lawful. His avarice knew no bounds. He outlawed seventeen counties at once, on a frivolous pretence, merely to raise money by way of fines for misconduct. 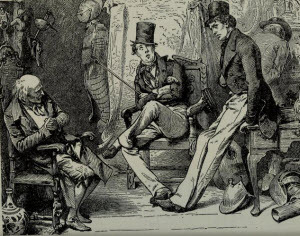 In short, he did as many dishonest things as he could; and cared so little for the discontent of his subjects--though even the spaniel favourites began to whisper to him that there was such a thing as discontent afloat--that he took that time, of all others, for leaving England and making an expedition against the Irish. He was scarcely gone, leaving the DUKE OF YORK Regent in his absence, when his cousin, Henry of Hereford, came over from France to claim the rights of which he had been so monstrously deprived. He was immediately joined by the two great Earls of Northumberland and Westmoreland; and his uncle, the Regent, finding the King's cause unpopular, and the disinclination of the army to act against Henry, very strong, withdrew with the Royal forces towards Bristol. Henry, at the head of an army, came from Yorkshire (where he had landed) to London and followed him. They joined their forces--how they brought that about, is not distinctly understood--and proceeded to Bristol Castle, whither three noblemen had taken the young Queen. The castle surrendering, they presently put those three noblemen to death. The Regent then remained there, and Henry went on to Chester. All this time, the boisterous weather had prevented the King from receiving intelligence of what had occurred. At length it was conveyed to him in Ireland, and he sent over the EARL OF SALISBURY, who, landing at Conway, rallied the Welshmen, and waited for the King a whole fortnight; at the end of that time the Welshmen, who were perhaps not very warm for him in the beginning, quite cooled down and went home. When the King did land on the coast at last, he came with a pretty good power, but his men cared nothing for him, and quickly deserted. Supposing the Welshmen to be still at Conway, he disguised himself as a priest, and made for that place in company with his two brothers and some few of their adherents. But, there were no Welshmen left--only Salisbury and a hundred soldiers. In this distress, the King's two brothers, Exeter and Surrey, offered to go to Henry to learn what his intentions were. Surrey, who was true to Richard, was put into prison. Exeter, who was false, took the royal badge, which was a hart, off his shield, and assumed the rose, the badge of Henry. After this, it was pretty plain to the King what Henry's intentions were, without sending any more messengers to ask. The fallen King, thus deserted--hemmed in on all sides, and pressed with hunger--rode here and rode there, and went to this castle, and went to that castle, endeavouring to obtain some provisions, but could find none. He rode wretchedly back to Conway, and there surrendered himself to the Earl of Northumberland, who came from Henry, in reality to take him prisoner, but in appearance to offer terms; and whose men were hidden not far off. By this earl he was conducted to the castle of Flint, where his cousin Henry met him, and dropped on his knee as if he were still respectful to his sovereign. 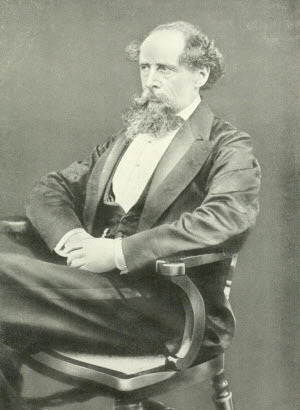 'Fair cousin of Lancaster,' said the King, 'you are very welcome' (very welcome, no doubt; but he would have been more so, in chains or without a head). After this, the trumpets sounded, and the King was stuck on a wretched horse, and carried prisoner to Chester, where he was made to issue a proclamation, calling a Parliament. From Chester he was taken on towards London. At Lichfield he tried to escape by getting out of a window and letting himself down into a garden; it was all in vain, however, and he was carried on and shut up in the Tower, where no one pitied him, and where the whole people, whose patience he had quite tired out, reproached him without mercy. Before he got there, it is related, that his very dog left him and departed from his side to lick the hand of Henry. The day before the Parliament met, a deputation went to this wrecked King, and told him that he had promised the Earl of Northumberland at Conway Castle to resign the crown. He said he was quite ready to do it, and signed a paper in which he renounced his authority and absolved his people from their allegiance to him. He had so little spirit left that he gave his royal ring to his triumphant cousin Henry with his own hand, and said, that if he could have had leave to appoint a successor, that same Henry was the man of all others whom he would have named. Next day, the Parliament assembled in Westminster Hall, where Henry sat at the side of the throne, which was empty and covered with a cloth of gold. The paper just signed by the King was read to the multitude amid shouts of joy, which were echoed through all the streets; when some of the noise had died away, the King was formally deposed. Then Henry arose, and, making the sign of the cross on his forehead and breast, challenged the realm of England as his right; the archbishops of Canterbury and York seated him on the throne. The multitude shouted again, and the shouts re-echoed throughout all the streets. No one remembered, now, that Richard the Second had ever been the most beautiful, the wisest, and the best of princes; and he now made living (to my thinking) a far more sorry spectacle in the Tower of London, than Wat Tyler had made, lying dead, among the hoofs of the royal horses in Smithfield. The Poll-tax died with Wat. The Smiths to the King and Royal Family, could make no chains in which the King could hang the people's recollection of him; so the Poll-tax was never collected.